How to put a lid on your iPhone's cellular data use—and avoid nasty surprises on your monthly wireless bill. Sure, four (or six, eight, or more) gigabytes of cellular data probably sounded like a lot when you first signed up for your iPhone data plan. But thanks to the latest data-hungry iOS apps and features, a GB of mobile data isn’t what it used to be. Indeed, you’d be amazed how quickly your iPhone (or your LTE-enabled iPad, for that matter) can gobble up mobile data—particularly if you’re, say, watching HD-quality Netflix videos, streaming iTunes Match songs, using your iPhone’s personal hotspot with your laptop, or letting iOS update your apps automatically. With the right settings enabled, iOS will automatically download any new music, apps, or iBooks purchased by any of your iCloud-connected devices. Even better, your iPhone can automatically download and install updates for all your iOS apps. You can stop iOS’s “automatic downloads” feature from draining your monthly data allowance by blocking its access to cellular data. While certainly convenient, “automatic downloads” can put a serious dent in your monthly cellular data allowance, especially if you have a lot of iOS apps installed. Luckily, you can flip a switch to block cellular access to automatic downloads, and doing also turns off the spigot for two other data-hogging features: iTunes Radio and iTunes Match. Just tap Settings, iTunes & App Store, then flip off the “Use Cellular Data” switch. The only downside is that you can’t pick a choose which automatic download features can use cellular data; instead, it’s an all-or-nothing deal. In other words, if you don’t let your iPhone downloading app updates over cellular, you won’t be able to stream iTunes Match tracks on your mobile network, either. FaceTime makes for a great way to keep in touch with far-flung family and friends, as well as a surprisingly easy way to drain your monthly cellular data allowance. There’s an easy way to shut off FaceTime’s cellular access completely. You’ve got a couple of options when it comes to limiting FaceTime’s cellular use: either exercise a little self-discipline when it comes to non-Wi-Fi video calls, or shut off FaceTime’s cellular access completely. If you picked option number two, tap Settings, Cellular, scroll down to the FaceTime setting (under the “Use cellular data for” heading), then flick the “off” switch. Bonus tip: You can turn off cellular access for any of your apps from the Cellular settings screen, not just FaceTime. Whether you’re stuck at an airport or cooling your heels in a hotel room, watching a movie on Netflix over your iPhone’s speedy LTE connection can be a tempting diversion. If you can’t live without Netflix while you’re on the road, you can dial down your Netflix video quality to save bandwidth. But think twice before binge-watching an entire season of House of Cards over LTE. Netflix (or another video-streaming service, for that matter) can easily chomp a gig or more of data an hour for HD-quality video. Indeed, a couple of HD Netflix movies could blow through an entire month of cellular data. So take it easy when it comes to streaming Netflix, YouTube, or other videos over cellular. Remember, even just a few minutes each day can add up. If you simply can’t live without Netflix while you’re on the road, try dialing down your Netflix video quality to save bandwidth. Open your Netflix account in a desktop browser, visit the Your Account screen, click the “Playback Settings” screen, then pick an option: Low (think sub-DVD quality, but only a third of a gigabyte of data use per hour), Medium (0.7 GB an hour for SD-quality video), or High (3GB an hour or more for HD-plus quality). A recent update of Facebook’s iOS app added an eye-popping new feature: auto-play videos, which start playing automatically as you scroll through your news feed. All those auto-playing videos will start to add up. It’s a nifty feature, and the default “smart auto-play” setting supposedly adjusts your auto-play video quality depending on your battery life and whether you’re on a cellular network. 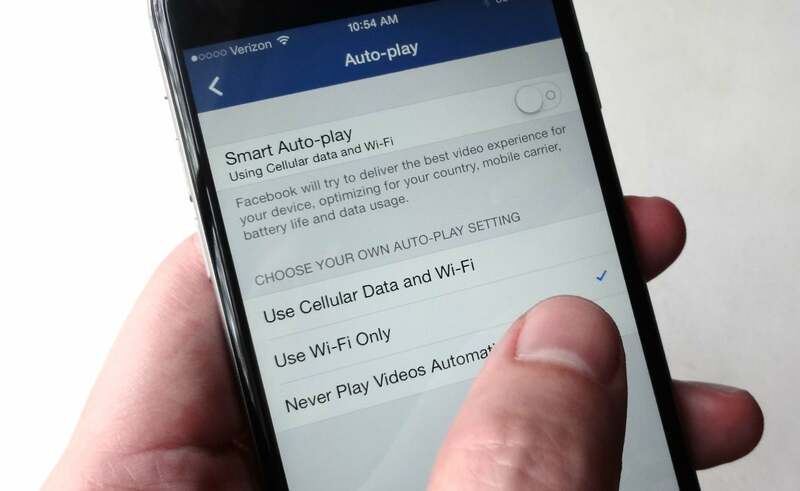 Still, all those auto-playing videos can add up when it comes to cellular data. A little casual web browsing over your iPhone’s LTE connection probably won’t drain your monthly data allowance on its own. Again, though, it all adds up. Frugal iPhone users should consider using a bandwidth-conscious mobile browser—one that “crunches” webpages into smaller, more digestible chunks of data. That’s why frugal iPhone users would be well served with a bandwidth-conscious mobile browser—specifically, one that “crunches” webpages into smaller chunks that consume less cellular data. Among the options: Opera Mini, a free browser that shaves hefty chunks of data from webpages, and Google Chrome, which crunches webpages with its Google-hosted “Data Saver” feature (tap the menu button in the top corner of the screen, then tap Settings, Bandwidth, Data Saver). Make sure your podcast manager of choice only downloads new podcasts over Wi-Fi, not cellular. So imagine my surprise when a rare text alert from my carrier landed on my phone a day or so later: somehow, we’d used more than 90 percent of our cellular data for the month. What happened? Well, turns out the podcast apps on our iPhones hadn’t gotten the memo about being careful with bandwidth, and they dutifully downloaded a fistful of new podcasts—yes, including several lengthy video episodes. Oops. Moral of the story: Make sure your podcast manager of choice only downloads new podcasts over Wi-Fi, not cellular. For the iOS Podcasts app, tap Settings, scroll down to Podcasts, then flip on the “Only Download on Wi-Fi” setting. Don’t see a similar setting for your favorite podcast app? You can always block its cellular access. Tap Settings, Cellular, find your podcast app in the big list of apps, and flip off its cellular switch. Turning your iPhone into a portable hotspot makes for a great way to keep your laptop connected while you’re on the go—and it’s also a recipe for a jumbo-sized wireless bill. 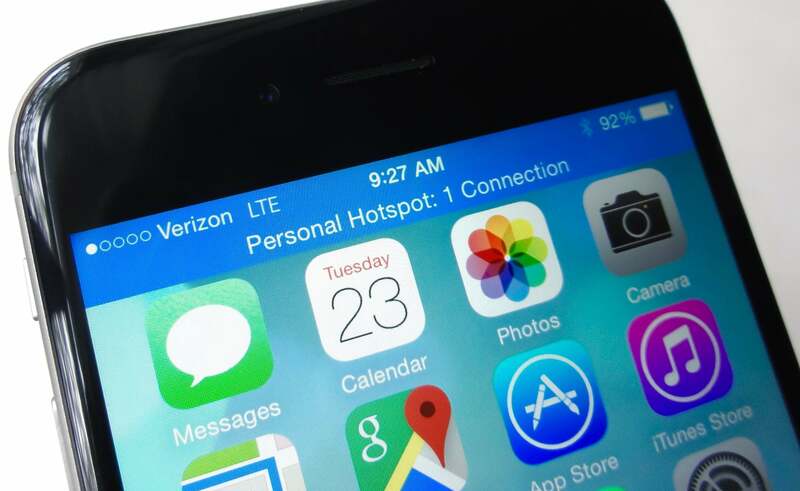 If used unwisely, your iPhone’s “Personal Hotspot” feature could lead to a surprisingly large wireless bill. Unless you tell your desktop or notebook PC otherwise, it’ll assume it’s using a no-limit Internet connection, leaving it free to download massive system and app updates, grab file attachments from your email provider, sync your Dropbox and Google Drive folders, and perform any number of data-hogging activities. That said, even the “metered connection” flag won’t stop your laptop from syncing, say, those massive video files in your Dropbox, or pinging Outlook for new messages and attachments every five minutes. Make sure to pause any file-syncing apps on your desktop before you connect using your iOS Personal Hotspot, and consider using a web client for checking email. Users of iTunes on the desktop should look out for automatic podcast, music, and video downloads. And yes—previous warnings about Neflix, YouTube, and other video-streaming services still apply.